LucasArts Admits Star Wars Fans Have Been "Forgiving"
LucasArts Executive Producer Haden Blackman says Star Wars fans have been "forgiving" over the years, admitting that many of the games based on the franchise probably haven't been as good as they should have. There aren't many game franchises like Star Wars. On one hand, you've got TIE Fighter; on the other, there's The Gungan Frontier. The range of genres bearing the legendary name is all over the map and so too is their level of quality, which Blackman admits has been a problem. "Star Wars fans have been forgiving over the years," he said in an interview with MCV. "But we don't take that for granted. We are so paranoid about tarnishing Star Wars. We want to make every game as good as possible, but it doesn't always work out that way." He hopes, however, that it will "work out that way" for The Force Unleashed 2, the sequel to the 2008 release that made choking a guy by pointing at him look like something you could train your dog to do. 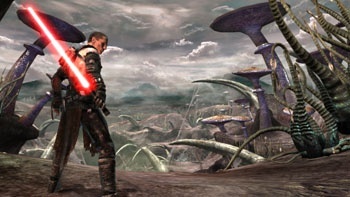 "We see Force Unleashed as a big Star Wars event," Blackman said. "We feel like it is a genuine part of the Star Wars lore and it continues the saga. So licensing is fully behind it and we are doing most of the stuff you would expect from a major Star Wars launch." "We definitely know that people who never played a Star Wars video game before decided to get Force Unleashed because they read the graphic novel or the book, and wanted to see how it played out in the game," he continued. "And we've seen those who own the game buy toys and books, too." Yet Blackman apparently has more faith in the power of the Lucas marketing machine than in the game itself and was oddly reluctant to predict that it would be a hit with fans. "The Force Unleashed 2 is a better game," he said. "Whether it review or sells as well, I have no idea."